You might see reference to "days" versus "terms" in reference to working capital. 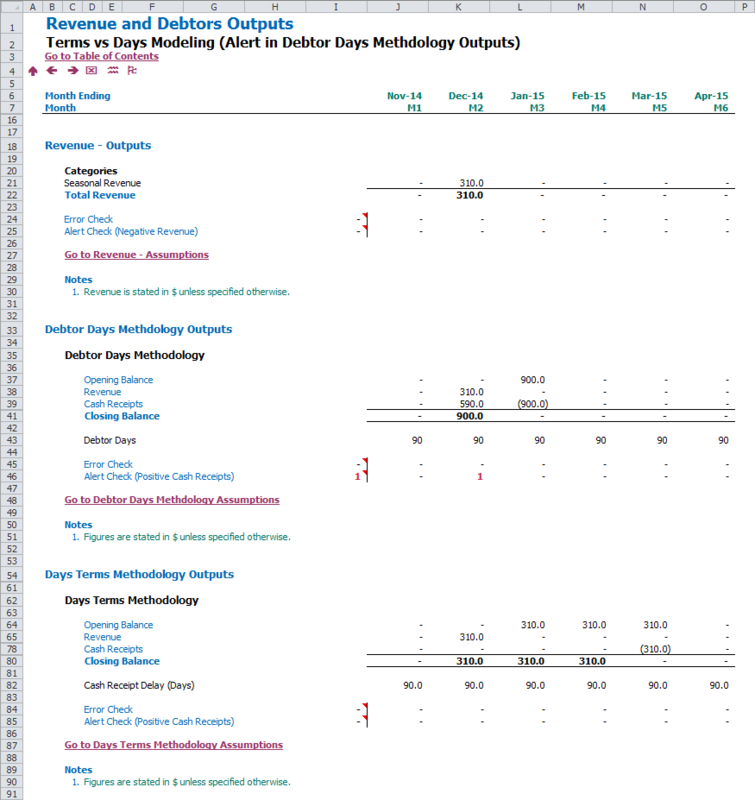 The following example illustrates these two main approaches to modeling working capital side-by-side. This applies to any working capital but for simplicity has been illustrated here using revenue and trade debtors. The amount of revenue for each period of modeling is converted to a daily amount. The forecast debtor days assumption is multiplied by this daily amount to determine the closing debtor balance. Finally, the cash receipts for the period are calculated as the balancing figure. The debtor days methodology has the benefit that it is simple to construct and the logic is easy to comprehend. The issue with the approach is that it does not work so well with either seasonal businesses or in instances where the cash receipt period is longer than the model periodicity. This can be seen in the example (see below) where there is a single month of $310 revenue in Dec-14. Using the debtor days methodology the $10 per day of revenue calculates a closing trade debtors balance of $900, based on a 90 day assumption. This then implies positive cash payments of $590 as a balancing figure, i.e. we are giving our customers money (as indicated by the triggered alert). Finally, with no revenue in Jan-15, the 90 day assumption then creates a zero closing trade debtor balance, leading to all the cash being forecast as being received. The Debtor Terms methodology resolves these issues by modeling the specific receipt of each period of revenue on the terms at which it was sold. In the same example, the $310 of Dec-14 revenue is made on 90 days terms, so the modeling matches this revenue (entirely) forwards into the Mar-15 column. The benefit of the approach is that the cash flow modeling is extremely accurate and will reflect all the subleties that come with highly seasonal businesses, monthly, weekly or even daily cash flow analysis, as well as accurately modelling any planned movement in working capital terms. If you've got any questions or alternative ways of modelling working capital then hit me up! Note: the first "BPM-Days vs Terms Modeling.xlsb" file is also a dynamic Modano file, so Modano users can add additional revenue and trade debtor categories as normal.